The man who added the catch phrases "Git-R-Done" and "Lord, I Apologize" to the American lexicon and drew fans by the pickup truckload to his shows proved to be one of the most successful comics of the early 2000s. Dan Whitney, known better as Larry the Cable Guy, claims he was born in the back of an El Camino during a Foghat concert. His drawl may sound Southern, but Larry was raised on a pig farm in Pawnee City, NE. His upbringing was conservative, traditional, and churchgoing. That didn't mean that strip bars were out of the question when Larry reached 18 (maybe even a little earlier). Fascinated by this redneck life -- "redneck" being a term he is not only fine with, but endorses -- and always looking to comment on it, Larry used his humorous observations to captivate his friends, who dared him to try his hand at standup. He did in 1986 and the fans' reaction to his slow, approachable style had him hooked. Two years later, he relinquished his title as funniest bellhop at the Ramada Inn and set out for a career in comedy. 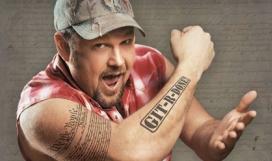 Vegastickets.com has a huge selection of Larry the Cable Guy tickets, along with all the Las Vegas headliners, shows and concerts. At Vegas Tickets you can count on finding Larry the Cable Guy Tickets and tickets to all the Best Vegas Shows and Las Vegas Concerts. We are a local Las Vegas ticket broker with a local office located just minutes from the world famous strip. Vegas Tickets is a long-standing member of the NATB (National Association of Ticket Brokers), ASTA (American Society of Travel Agents), and the Las Vegas Chamber of Commerce. We have Celine Dion tickets and all the Cirque du Soleil Vegas tickets. If you can’t find what you’re looking for on our website, please call one of our professional sales reps at 877-467-4697 and we will do our best to help you.